Has the College Football Playoff Already Been Decided? A mere 10 seasons ago, USC and Oklahoma opened the college football season ranked #1 and #2 in the preseason AP Poll and the Coaches Poll. They remained there the entire regular season, as neither lost a game. But as chance would have it, they weren’t the only undefeated teams that year. Both Auburn and Utah went undefeated, but neither could crack the top 2, and Oklahoma and USC went on to play in the BCS Championship game. That’s right, it was only 10 years ago that an undefeated SEC Champion was left out of the BCS title game. If you’ve only been following college football for 8 years, you probably just fell out of your chair and had a heart attack. No, that's not what I meant when I said the playoffs have already been decided! 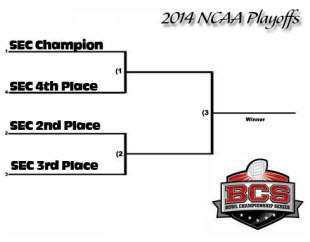 But if you think about it, the BCS Championship game was already decided before the season started. In the preseason poll, voters determined that USC and Oklahoma were better than Auburn and Utah. There was nothing either team could do to change that thinking. They were dependent on the teams ranked above them to have more losses than they did. Is this typical in college football? If the preseason poll has Team A ranked higher than Team B, and they finish the season with the same number of losses, will Team A still be ranked higher? If so, where a team is ranked in the preseason could have a major impact on whether or not they get selected to participate in the playoffs! I took the top 5 ranked teams in the AP Poll that had the same number of losses. The key is making sure they have the same number of losses. Last year Florida State was the only undefeated team, so of course they were going to be the top-ranked team regardless of their preseason ranking. But there were 5 teams ranked right below them with 1 loss (in total there were nine 1-loss teams, but I only used the 5 highest-ranked teams to keep the number of teams consistent from year to year). I recorded the order in which those 5 teams were ranked in the last regular season AP Poll (since the college football playoff will be decided before the bowl games, I’m ignoring the final AP Poll), and the order they were ranked in the preseason poll. For example, here is the data from 2013. Before the season started, Auburn was the lowest ranked team of the 5. However, voters changed their mind by the end of the season, ranking Auburn the highest out of the 5. Perhaps the Tigers finally got some justice from 2004! But 2 years' worth simply isn’t enough data. 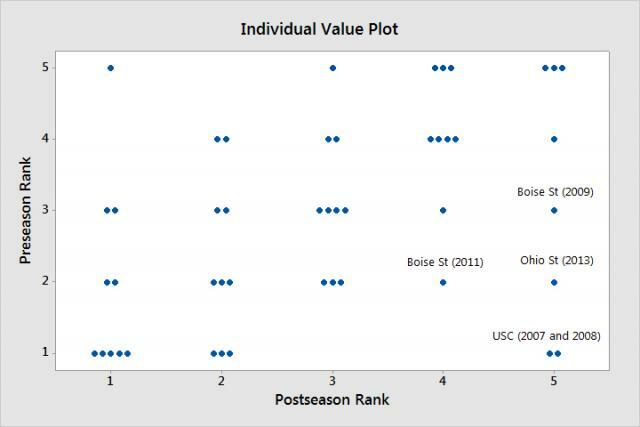 So I went back and collected similar data for the last 10 college football seasons. For most years I used a group of five 1-loss teams, since there weren’t enough undefeated teams to compare. And there were two years I wasn’t able to get a group of five, so I have 47 total teams. You can get the data I used here. 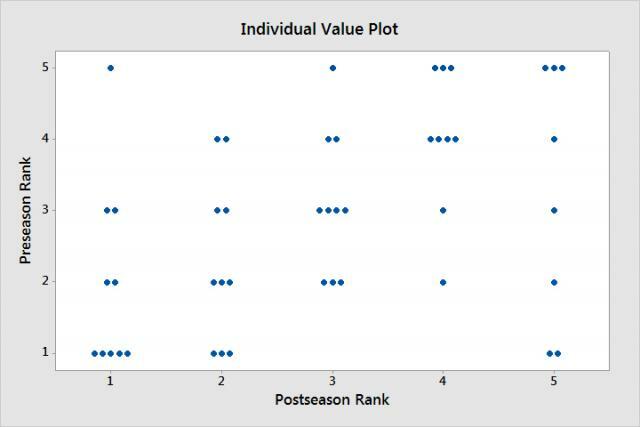 The first thing we’ll look at is an individual value plot showing a team’s preseason and postseason rank. If teams stay in the same order from the preseason to the postseason, we would expect most of the data points to fall along the diagonal from bottom left to top right. Most of the points do fall along the diagonal. In the bottom left corner, you’ll see that of the 10 teams that held the top spot in the final postseason rankings, half were the top-ranked team in the preseason too. A majority of the points continue going up the diagonal, indicating top-ranked teams with the same number of losses stay in the same order from preseason to postseason. But we should quantify this relationship to make sure it truly exists. First let’s look at the correlation between the two variables. To calculate the correlation between ordinal variables in Minitab, go to Stat > Tables > Cross Tabulation and Chi-Square. Then click Other Stats and select Correlation coefficients for ordinal categories. The correlation coefficient can range in value from -1 to +1. The larger the absolute value of the coefficient, the stronger the relationship between the variables. An absolute value of 1 indicates a perfect relationship, and a value of zero indicates the absence of relationship. Minitab displays two different coefficients, Pearson’s r and Spearman’s rho. For these data, they both equal about 0.44, indicating a positive association preseason rankings and postseason rankings. Teams ranked higher in the preseason tend to be ranked higher going into the postseason. We can take this analysis one step further by looking at the concordant and discordant pairs. A pair is concordant if the observations are in the same direction. A pair is discordant if the observations are in opposite directions. This will let us compare teams to each other 2 at a time. For example, let’s go back to our five 1-loss teams from 2013. Look at Auburn and Alabama. In the preseason, voters had Alabama ranked higher. But at the end of the season, they ranked Auburn higher. So this pair is discordant. Now look at Alabama and Ohio State. In the preseason, Alabama was voted higher. And even though the ranking of both teams fell during the season, Alabama still ranked higher at the end of the season. This pair is concordant. More concordant pairs means voters are keeping the same order as the preseason, while more discordant pairs means they’re switching teams. When I did this for the other 9 seasons, I ended up with a total of 89 pairs. Of those, 61 were concordant. That’s over 68%! In fact, there were only two seasons with more discordant pairs than concordant pairs (2013 and 2010, though my group in 2010 only had 3 teams). This give us further indication that if a team is thought to be better in the preseason, that thinking will not change throughout the season, given that the teams lose the same number of games. Which Teams Are Able to Move Up? We did see that voters change their minds on teams every now and then. After all, there were 28 discordant pairs. So which are these teams that are able to impress voters so much that they move ahead similar loss teams that were ranked ahead of them in the preseason? To answer this question, I’m going to show the individual plot again. But this time I’m going to add labels to the teams that moved up from their preseason ranking by at least 2 spots. Spoiler alert: Voters love the SEC! Five of the 6 teams that were able to improve their rank by at least 2 spots are from the SEC. In other words, the preseason rank for SEC teams does not matter. If they have a great season (much like Auburn did in 2013), they’ll be one of the top-ranked teams at the end of the year regardless of who was ranked ahead of them before the season. Which Teams Get Passed Over? Can we find a similar pattern with teams that start the season ranked high but then drop in the view of the voters eyes? 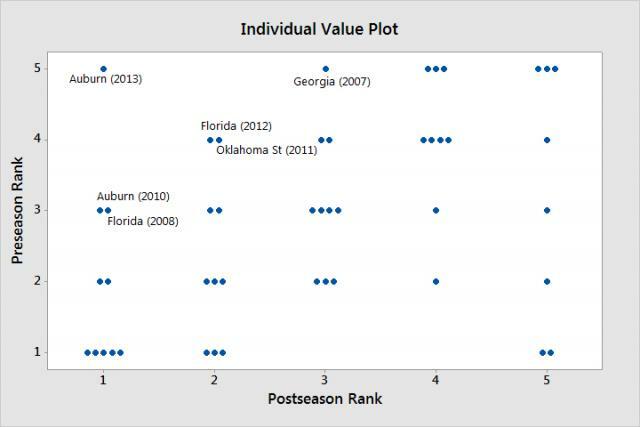 Here is the individual value plot with teams labeled that fell at least 2 sports from preseason to postseason. It’s no surprise to see Boise State on this list, as they played in a small conference at the time. The year 2009 was incredibly unlucky for them. They started the season ranked a respectable 14th and went undefeated. However, they were only able to move up to 6th, as 4 other teams also went undefeated, two of which (TCU and Cincinnati) passed Boise State in the rankings along the way. To add injury to insult, a 1-loss Florida team (not included in the data) was also ranked ahead of undefeated Boise State. What is really surprising is what happened to USC. In 2007, they started the season ranked #1 overall in the AP Poll. They lost two games, but so did just about everybody else in college football that season, including LSU, who played in and won the BCS Championship Game. But LSU wasn’t the only team to pass USC in the rankings with the same number of losses. Oklahoma, Georgia, and Virginia Tech did too. For crying out loud...Virginia Tech!?!? If that weren’t bad enough, the same thing happened in 2008. USC started the season ranked #3 in the AP Poll, and the #1 and #2 team would go on to lose multiple games. No BCS team went undefeated that year, and USC only lost a single game. So you would think their high preseason ranking would put them in one of the top 2 spots, and they would be playing the BCS title game. Except that’s not even close to what happened. Despite all of them being ranked lower in the preseason and losing a game, Florida, Oklahoma, Texas, and Alabama all jumped USC in the rankings. The takeaway, I suppose, is don't play in a small conference. And, uh, don't play on the west coast? Will This Trend Carry Over to the College Football Playoff? The selection committee won’t select the top 4 teams based on the AP poll. But the committee will be free to think on their own (like the AP voters do) instead of being locked into using certain criteria like the BCS did with using computers. It would be folly to think the committee doesn’t have any preconceived notion about which teams are the best, and I bet they are similar to the top ranked teams in the preseason AP Poll. And those notions may just decide who gets into the playoff! For example, we know that the SEC Champion is getting in (even if they start the season ranked low). And as the preseason #1 team, even a 1-loss Florida State team is a safe bet to get in. That leaves the champion of the other 3 major BCS conferences (Big 10, Pac-12, and Big 12) left to fight over 2 spots. Oregon and Oklahoma appear to be in the best spot, as they are ranked #3 and #4 in the preseason. If they win their conference, even a single loss shouldn’t hurt them assuming a Big 10 team doesn’t go undefeated. Meanwhile, to be on the safe side, Michigan State or Ohio State should hope one of those two teams ends up with more losses than them. If you’re coming out of nowhere to win one of those conferences, like maybe Nebraska, Kansas State, or Arizona State, you’re probably going to need some chaos to get in the playoffs. And considering there isn’t a single non-BCS school in the AP Top 25, I think it’s safe to say Cinderella isn’t going to make it to the ball this year. Now, the committee claims that there will be a more deliberative evaluation system and that there could be volatile swings from week to week, with lower-ranked teams moving ahead of higher-ranked teams without either team losing. Whether that actually happens or not (especially with non-SEC teams) remains to be seen. So at the end of the season we’ll compare the final rankings of the committee to the preseason AP Poll. Until then, enjoy the games! Just know that the order for which teams get into the playoffs may already have been decided!